Protect your Appliances and Electronics, Lawn & Garden products, Tablets and Laptops with Total Protection Plus. The plan offers Peace of Mind for your investment after the manufacture warranty expiration (with exception of food loss or power surge, which begins on date of product purchase). Ask a Sales Associate for plan details today. Your product will be repaired or replaced in the event that it meets coverage qualifications (mechanical/electrical failure) and it is not covered under any other insurance, warranty, guarantee and/or service agreement. Parts used to repair or replace your product may be new, used, refurbished, or non-original manufacturer parts that perform to factory specifications. Technological advances may result in a replacement product with a lower selling price than your original product. No refunds will be made based on the replacement product cost difference. If it is not repairable and a replacement product is not available, we will reimburse with (check, voucher, or store credit) and the value will not exceed the original product purchase price. Power Surge: product failure will be covered if it results from a power surge caused by power outage while it is properly connected to an approved surge protector. “No lemon” Guarantee: if your product has three (3) repairs covered under this contract for the same problem (qualifying service repairs) and a fourth (4th) repair is required for the same covered problem, replacement for original product will be approved with one of like, kind, quality. Food Loss (refrigerator/freezer covered product): coverage includes reimbursement for food loss of consequential perishable items that require refrigeration or freezing resultant from a covered claim for your product. Benefits under this special feature are limited to a maximum of $200.00 per covered service repair. Laundry Credit: coverage includes reimbursement of consequential laundry expenses up to $25.00 in the event your eligible covered product is determined by Warrantech to be rendered inoperable for more than seven (7) consecutive days after authorized servicer’s initial visit. Optional Coverage: Accidental Damage from Handling (ADH): when purchased, this optional coverage upgrade provides for the labor and/ or parts required to repair your covered product (or replacement, or reimburse for replacement, at our sole discretion) in the event of a covered claim for sudden and unforeseen accidental damage from handling (ADH); such as damage resulting from dropping the covered product, spilling liquid onto it or in association with screen breakage. Furniture & Upholstery protection plans are provided and administered by 4warranty Corporation of 10151 Deerwood Park Blvd, Bldg 100, Suite 330 Jacksonville, FL 32256, tel. (888) 202-5518 or www.espdownload.com. On approved claims the plan includes: free parts & labor from date of delivery, in-home nationwide service, no deductible, and replacement of like kind product when affected item can’t be repaired. Protect Your Furniture Investment - It is a WIN WIN! 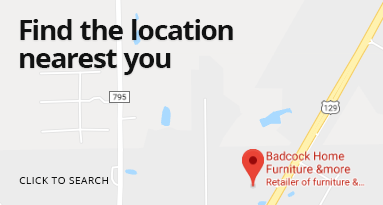 As an added feature, beginning May 15, 2012, if you never use the Protect-It service on any eligible items on the sales slip during your 3 years of total coverage, Badcock will give you a discount coupon equal to the full Protect-it retail price to use towards a future home furnishings purchase at Badcock! You can have the best of both worlds, protection for your purchase now, and get credit towards a new purchase with Badcock if you did not use it! *Minimum purchase amount will apply to discount coupon. You are not obligated to purchase a new Protect-It plan with the Win-Win feature minimum new merchandise purchase. Cannot be combined with any other offer or discount. Prices and Specifications subject to change without notice. The Win-Win customer feature is an agreement solely between you and W.S. Badcock and is not a benefit provided under this agreement, by the obligor or insurer"
**See terms and conditions for complete details. Service agreements Administered by 4warranty Corporation. COVERS THE COST TO REPAIR OR REPLACE YOUR PURCHASED ITEMS FOR UP TO 36 MONTHS OR UNTIL YOUR BALANCE IS ZERO. INCLUDES DAMAGE DUE TO FIRE, FLOOD, HURRICANE, TORNADO, THEFT, SMOKE, VANDALISM, MALICIOUS MISCHIEF AND LIGHTNING. IT ALSO COVERS PROPERTY PURCHASED FROM DAMAGE DURING TRANSPORT IN A VEHICLE. A completed claim Form, photos of damaged items, and a fire report or police report (if applicable) are required to process a claim. PAYS A MONTHLY BENEFIT TOWARD YOUR ACCOUNT BALANCE IF YOU BECOME INVOLUNTARILY UNEMPLOYED DUE TO A COVERED EVENT FOR A PERIOD LASTING LONGER THAN 30 CONSECUTIVE DAYS. A completed claim Form is required to process a claim. PAYS A MONTHLY BENEFIT TOWARD YOUR ACCOUNT BALANCE IF YOU’RE UNABLE TO WORK AND UNDER THE CARE OF A DOCTOR DUE TO A QUALIFIED INJURY OR SICKNESS LASTING LONGER THAN 30 CONSECUTIVE DAYS. A completed claim Form is required to process a claim. PAYS YOUR COVERED ACCOUNT BALANCE IN THE EVENT OF YOUR DEATH. A completed claim Form along with a death certificate with cause is required to process a claim. Submit completed claim form and all supporting documentation to customer_ins@badcock.com or fax to 863-869-7964. SAFEGARD is Easy, Affordable and Convenient! This information does not contain the full terms, exclusions and conditions of the policy. Please refer to the certificate of insurance for full details on all coverages including any exclusions and/or limitations. The certificate of insurance is available for review at your local Badcock store. Involuntary Unemployment and Credit Disability benefits are paid from the first day after a 30-day consecutive waiting period has been met. Life insurance coverage is not available to account holders over the age of 70. Products are underwritten by one or more of the following Life of the South Companies, depending on your state of residence: Life of the South Insurance Company and Insurance Company of the South.